The Dream Enchantress Tarot is a fantasy themed deck illustrated by Marco Nizzoli, creator of the Secret Tarot. His comic book style artwork tells the story of the mysterious Dream Enchantress. This is a feminine deck populated almost entirely with women characters. Even male cards such as the Emperor and the Kings are portrayed by masked females. These women tend to be elvish in appearance, with lithe forms and pointed ears. 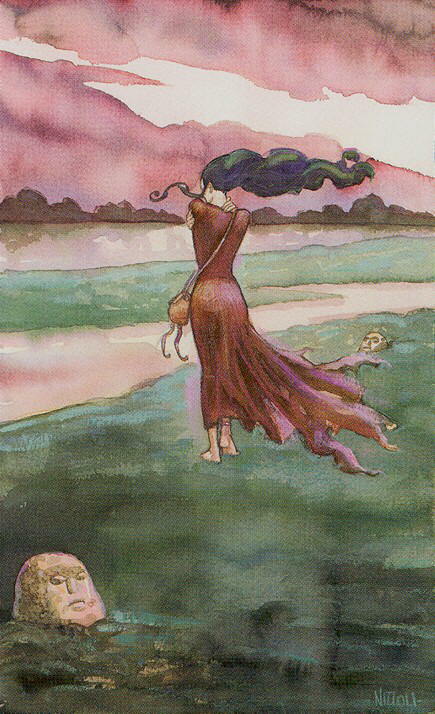 The Hermit, embracing herself, is walking away from the viewer toward a river where strange stone faces stare up from the ground around her as though they are the last memories of hermits who have gone before, making us wonder if she will one day join them in their statuesque isolation.